Whose face could have been the most recognisable on the ballot paper come Polling Day? That of Lee Kuan Yew, who has passed away but whose presence would still be felt. There will indeed be much analysis by historians in the years to come of the senior Lee’s exact role in the development of Singapore. The extent of his role, the what ifs (if there had not been people like Goh Keng Swee, Toh Chin Chye and S. Rajaratnam and Albert Winsemius around, if Lim Chin Siong had outwitted the PAP secretary-general, if we had remained in Malaysia and so on). Whether or not we agree with all these epithets, the outpouring of emotion at his wake and funeral showed that many Singaporeans did acknowledge their debt to Lee. It would have been stupid for the PAP not to, for lack of a more elegant phrase, cash in on the IOU. “Singaporeans, you owe it to Lee Kuan Yew to vote the PAP in, to carry on his good work.” It did and has not stopped doing so. But overplaying this Lee Kuan Yew card is to rely on a double-edged sword. There has always been a core of PAP supporters who will stand by it, come rain or shine. Those who voted Tony Tan to be President are in this group. Who are they? Heartlanders who respect and implicitly trust Lee Kuan Yew and are comfortable with the status quo, civil servants who have benefitted from having secure jobs, SME types who enjoyed some kind of exploitative prosperity because of the relatively cheap labour under the pro-immigration policy. In elevating Lee to such a pantheon to maintain such backing and extend it beyond to less committed Singaporeans under the overarching Lee Kuan Yew Effect is risky for the PAP. Let’s put aside a possible turn-off response or the automatic reaction of judging the performance of the current set of PAP leaders against that of the first generation. Different times, different needs, different expectations. So, maybe not fair. But if the PAP continues in this election to invoke relentlessly the legacy of Lee, that is precisely what voters will assess them against. And many already know that an exceptional leader has been replaced by largely nondescript political journeymen. 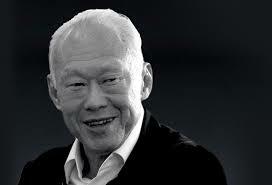 Let Lee Kuan Yew rest in peace, please.